Kwashiorkor sufferers show signs of thinning hair, edema, inadequate growth, and weight loss. 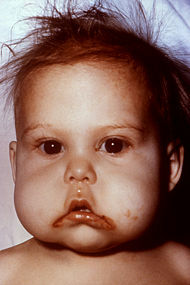 The stomatitis on the pictured infant indicates an accompanying Vitamin B deficiency. Kwashiorkor is a childhood deficiency illness usually attributed to insufficient dietary protein and characterized by potbelly (swollen, bloated abdomen), anemia, loss of hair and change in hair color, loss of skin pigmentation, lethargy, and irritability, among other conditions. While severe protein malnutrition is the commonly stated cause, other or additional causes have been proposed. Kwashiokor is more prevalent in underdeveloped and overpopulated tropical and subtropical regions of the world where the diet is high in starch vegetables and low in meat and dairy products. When a child is nursing, it receives certain amino acids vital to growth from its mother's milk. When the child is weaned, if the diet that replaces the milk is insufficient, the child may develop kwashiorkor. As a dietary condition, kwashiokor is fully preventable. However, there is a larger social responsibility tied to such prevention. Many victims of kwashiokor are precluded from a more suitable diet due to famine or are limited in their dietary choices due to economic conditions. Whereas some areas of the world have a wealth of protein, and the problem may be eating too much, some other areas are not so fortunate. Jamaican pediatrician Cicely D. Williams introduced the name into international scientific circles in a 1935 Lancet article (Williams 1935). The name is derived from one of the Kwa languages of coastal Ghana and means "the one who is displaced" reflecting the development of the condition in the older child who has been weaned from the breast. Among the first symptoms may be lethargy and irritability. These symptoms can be followed by a variety of conditions. A common symptom of kwashiorkor is a swollen and bloated abdomen (potbelly). This is generally attributed to two causes. First, there is a condition of ascites (an accumulation of fluid in the peritoneal cavity) due to increased capillary permeability from the increased production of cysteinyl leukotrienes (LTC4 and LTE4) as a result of generalized intracellular deficiency of glutathione. Ascites is also thought to be attributed to the effect of malnutrition on reducing plasma proteins (discussed below), resulting in a reduced oncotic pressure and therefore increased osmotic flux through the capillary wall. A second cause may be due to a grossly enlarged liver due to fatty liver. This fatty change occurs because of the lack of apolipoproteins, which transport lipids from the liver to tissues throughout the body. Other symptoms include a reddish discoloration of the hair, loss of hair, and depigmented skin. The child has an apparently-miserable appearance with a "bull-dog" face. Children may have a thinning of the muscles, dry skin with a rash, diarrhea, anemia, and stools that are bulky and with undigested food. Chronic kwashiokor can lead to stunted mental and physical development and death. Victims of kwashiorkor also fail to produce antibodies following vaccination against diseases including diphtheria and typhoid. Overall mortality can be as high as 60 percent. Generally, the disease can be treated by adding protein to the diet, particularly as dried milk. Long-term prevention requires dietary changes to make sure all the essential nutrients are consumed. In the case of other physical or behavior causes (chronic alcoholism, kidney disease, etc. ), other medical treatments may be required. There are various explanations for the development of kwashiorkor, and the topic remains controversial (Krawinkel 2003). It is now accepted that protein deficiency, in combination with energy and micronutrient deficiency, is certainly important but is not necessarily the sole or even key factor. The condition is likely to be due to deficiency of one of several type one nutrients (e.g. iron, folic acid, iodine, selenium, vitamin C), particularly those involved with anti-oxidant protection. Important anti-oxidants in the body that are reduced in children with kwashiorkor include glutathione, albumin, vitamin E, and polyunsaturated fatty acids. Therefore, if a child with reduced type one nutrients or anti-oxidants is exposed to stress (e.g. an infection or toxin), he or she is more liable to develop kwashiorkor. Ignorance of nutrition can be a cause. Dr. Latham, director of the Program in International Nutrition at Cornell University, cited a case where parents who fed their child cassava failed to recognize malnutrition because of the edema caused by the syndrome and insisted the child was well-nourished despite the lack of dietary protein. Other, non-dietary causes of kwashiokor may include chronic alcoholism, kidney disease, and gastrointestinal tract disorders such that nutrients are not adequately absorbed by the intestines. Other malnutrition syndromes include marasmus and cachexia, although the latter is often caused by an underlying illness. Krawinkel, M. “Kwashiorkor is still not fully understood.” Bull World Health Organ 81(12): 910-911, 2003. Urvina, S. Malnutrition in third world countries Christian Century. May 23, 1985, p. 550. Retrieved October 1, 2007. Williams, C. D. “Kwashiorkor: a nutritional disease of children associated with a maize diet.” Lancet 229: 1151-2, 1935. This page was last modified on 2 April 2008, at 10:45.